Visitors are being drawn to the country en masse, boosting the country’s GDP and showcasing the importance of the tourism industry to the Greek economy. Greece is also benefiting from new flights from the U.S. to Athens as well as an increase in cruise traffic. Disney Cruise Line is returning to the destination in the summer of 2020 and Norwegian will offer seasonal flights to Athens from New York City. For those looking to see the country by sea, Variety Cruises small-ship experiences offer travelers a selection of cruises that explore some of Greece’s top destinations. Ships hold no more than 71 guests, and all of the line’s mega yachts and small ships offer oceanview cabins and 360-degree unobstructed views, from which passengers can take in the country’s coastal gems. 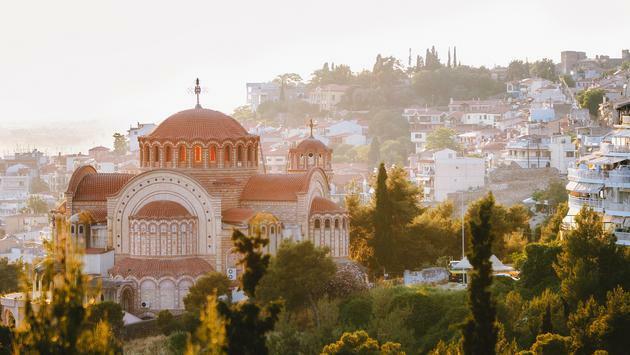 Small groups provide an intimate experience both onboard and onshore with carefully crafted itineraries that highlight the culture and beauty of Greece. Greece provides a unique opportunity for travelers to delve deep into ancient cultures and see some of the world’s oldest treasures. Athens serves as a central hub for visitors. It’s considered the historical capital of Europe with a long history that dates back to the Neolithic Age. But while it is steeped in history, it is also a modern metropolis. Visitors will want to stroll the narrow streets of the Plaka, explore the ancient Acropolis, the Parthenon temple and museums, including the Acropolis Museum and the National Archaeological Museum. Stunning view of Santorini from above. If you are going to go island hopping while visiting Greece, a stop in Santorini should be considered a must. The white houses juxtaposed against an impossibly blue sea are truly idyllic, but it’s the sunset that truly takes your breath away as the buildings shine brightly as the sun dips below the horizon. 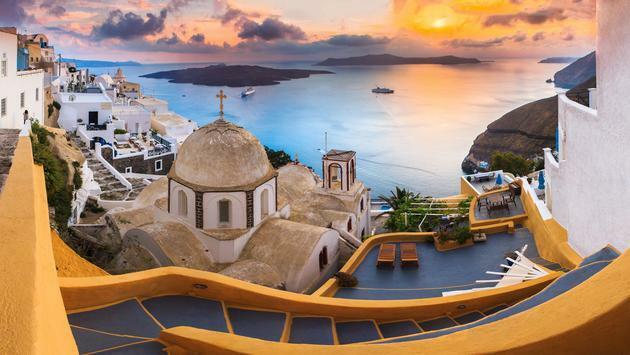 Any number of cruise itineraries sail to Santorini, including its Classical Greece sailing, traveling roundtrip from Athens. Visitors can also board ferries that will take them to Santorini as well as a number of other islands. 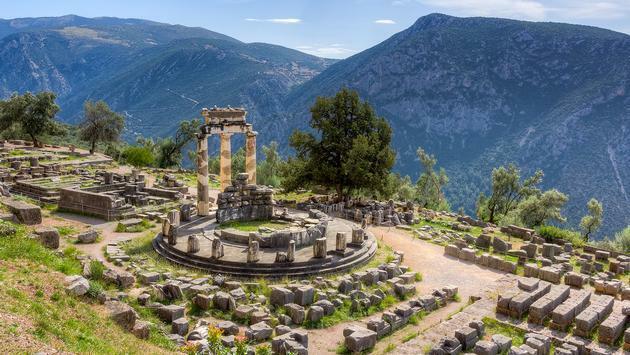 Delphi is steeped in ancient history. It is the site of the 4th-century-B.C. Temple of Apollo and was once considered one of the most legendary oracles in the world. 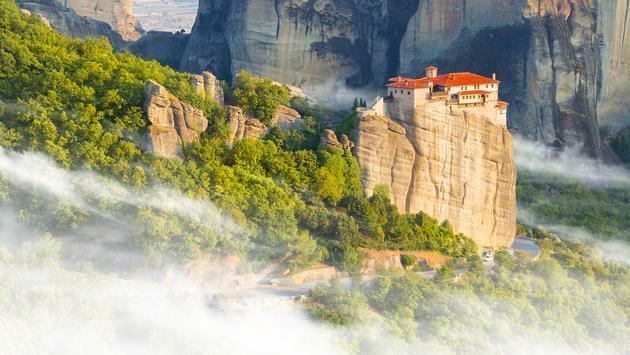 It’s located on Mount Parnassus in the southern part of mainland Greece. Many tour operators feature Delphi on Greece itineraries, as do cruise lines such as Variety Cruises. Travelers can also do a day trip from Athens to explore the city. The stunning monasteries perched on top of the “floating” rock formations are as remarkable as the rock formations themselves. Located in central Greece, the area is featured on many tours. The two closest towns are Kalambaka and Kastraki. 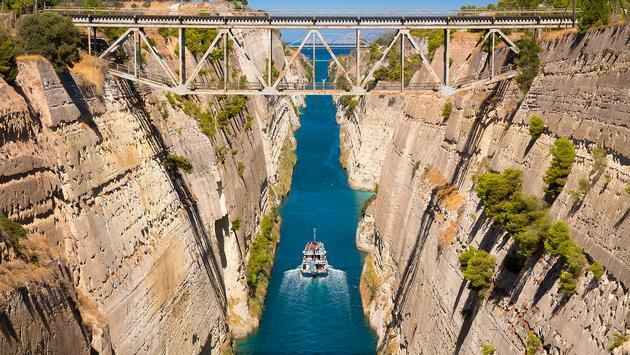 Completed in 1893, the canal is considered an engineering marvel, it’s also one of the smallest canals, linking mainland of Greece to the Peloponnese Peninsula and save time for sailing ships. In fact, it’s so narrow that ships greater than 58 feet wide will not fit through. Visiting the canal can be a day trip from Athens or often navigated by small ship cruises on select Greece sailings. Thessaloniki is the second-largest city in Greece and one of the hippest destinations in the country. Beautiful beaches, high-end hotels and trendy restaurants bring travelers from around the world, as do events like the Thessaloniki Film Festival and the International Trade Fair. The region is also steeped in history with evidence of Roman, Byzantine and Ottoman history remaining. 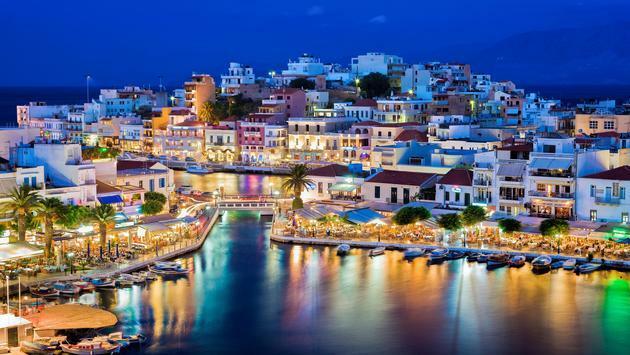 Crete is the fifth largest island in the Mediterranean and is Greece’s largest. It offers travelers a little bit of everything Greek, with stunning white-sand beaches to Mount Ida and the Ideon Cave, known in Greek Mythology as the birthplace of Zeus. Crete offers a long tourist season, with ideal weather stretching from mid-May sometimes through mid-October. As the largest island, it’s also easy to reach with three airports with direct flights from several European hubs. Ferries and catamarans also shuttle visitors to Crete.